Let’s talk about why self-awareness is worth your very precious time and energy. What does someone with a lot on their plate get out of it? When I first began learning about mindfulness and the benefits of self-awareness it felt a little too good to be true. I aim to spend my time (always a practice) following Pareto’s Law (the 80/20 principle) – and here before me I have a clear habit that seems to not only make it into the 20% of my personal endeavors but of multiple domains across the personal and professional spectrum. 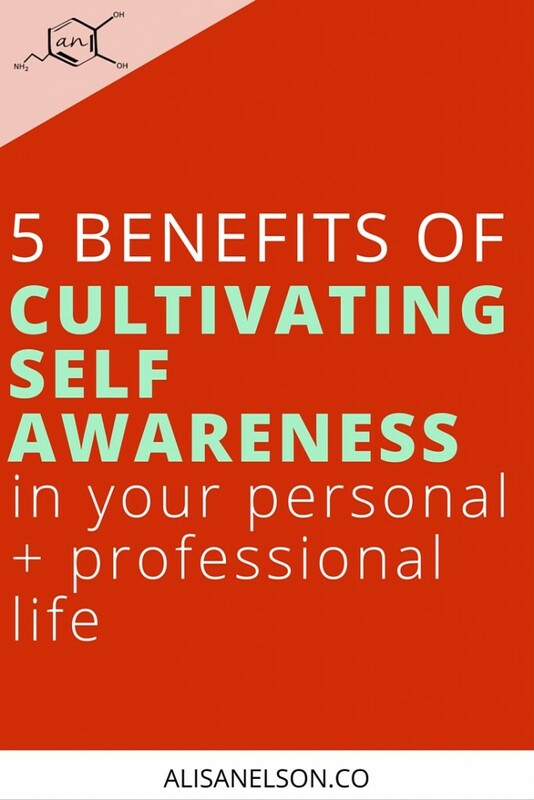 Below I’m going to get down into just 5 benefits that self-awareness brings with practice. This is certainly not all of them, nor will it be a complete explanation of why they come out of self-awareness (that’s a very long post – trust me, I tried it). The 5 benefits I’m highlighting today build on each other. It’s one of those things that I realized as I looked back over their effects on my life – there is a progression that happens when we begin to ask why about our behavior and peel away the layers. Freedom from fear isn’t the abolition of fear but a choice to do something even when fear is present. How could we possibly choose to do something when our brains are telling us it’s dangerous to our survival? Self-awareness. You’ve likely experienced this even on an unconscious level – you’re interested in performance and growth, right? At some point along the way you have felt afraid and decided to move forward anyway. Fear is a natural occurrence. We share it with other animals – a natural instinct to avoid anything that appears to be a threat. As humans, we are capable of higher thinking than instincts. Therefore we can take action based on knowledge of the system we are in rather than an instinctual avoidance of pain. Fear doesn’t just go away – our brains still send signals to indicate threat. And there are certainly instances when we need to react blindly to those signals – like when our brains discern a snake in the path before we have consciously seen it. What self-awareness allows is for greater independence from our fear in our decision-making. From here we can grow and expand our areas of comfort as we make strategic choices to nudge forward in the direction of our dreams. Building on top of the first benefit we’re going to talk about procrastination. We all have those tasks that just sit on our to-do lists. Some are, of course, just not important or urgent enough (and we’ll talk about those momentarily) but others are important and yet they sit there. Why? Asking why gives you back the power over your behavior. Maybe it’s just really not that important – then move it off your to-do list. Maybe it is important but you don’t have all the pieces – then make the action item about getting the missing pieces (or pass it off to someone else). Fear is another huge reason we procrastinate – freeing yourself from the reaction fear brings will help you get the clarity you need to take action and move forward. Self-awareness helps you to value your time and energy appropriately. The natural next step once you have that is more care in how you make decisions about spending your time and energy. For example, I grew up getting beef from my grandparent’s farm. And while this made it very normal to enjoy a steak on a semi-regular basis (there were 7 of us…) we grew up knowing that we had it really good. The beef we had was very valuable – and treated as such. Now, as an adult, I still get beef from my grandparents. And we savor the steak – even when we eat it in a normal, everyday meal. We’ve assigned a certain level of value and our behavior matches because we are aware of the value. It takes effort to actively remember the value you’ve attributed to your time and energy. In the face of a painful situation – like getting your idea shot down by your boss or receiving tactless negative feedback from a client – our gut reaction is to escape the moment. You go back to your desk and start clicking through the internet or you throw up an angry rant on Facebook. Brene Brown studies and writes about shame and vulnerability. She calls these kinds of habits “armoring up” against vulnerability (showing up and putting ourselves out there when the outcome is uncertain). A couple ways we armor up are by numbing (clicking through the internet) or by perfectionism (including getting angry when things don’t go the way we expected or highlight imperfection). So how does self-awareness play in here? Instead of numbing or perfectionism, self-awareness invites curiosity, investigation, and action. It offers the opportunity to put painful experiences into perspective. Why did it hurt so bad when your boss rejected your idea? Maybe it’s because your goal was attention and prestige. Or maybe it’s because the idea came from a deeper desire or dream you have for the world. Getting curious (as Brown calls it) gives you the chance to better understand your true motivations and put them up against your values – to see how this piece fits into the bigger story. Asking why lets you decide consciously if this moment is worth your time and energy and allocating both resources accordingly to take the appropriate action – action that inspires growth. This is resilience – resisting the urge to armor up in the face of vulnerability and instead taking positive action to learn and grow from the experience. As you ask questions and learn about your current habits of avoiding vulnerability, it’s important to keep in mind that these aren’t innate flaws. It’s your brain’s current pattern of self-preservation and it just needs some fine tuning. This leads into the next benefit of self-awareness. Habits form by repeated action. Your brain uses insulation of neurons (action called myelination) to strengthen any action or thought you have over and over again. A habit might be “when I’m bored, I chew on my fingernails” or it might be the exact movements a pro tennis player makes to perform a backhand. There are various strategies for both the weakening of neuron connections and the strengthening. Self-awareness makes both possible. You see, our brains have a lot of responsibilities. So they like to be able to shift into autopilot and they don’t much like change. Thankfully, as with fear, we are capable of overcoming that characteristic of our brains and change anyway. So cool, right? Self-awareness gives us the opportunity to weaken the habits we don’t like so much (after over 20 years of nail biting, I’m a changed woman!) and strengthen the habits we want (systematic practice of all the little movements that play into a perfect back hand). Bonus :: Applying knowledge of the system also makes some habits come without much effort – paying attention to the right things gives you a snowball effect. I love the brain. Stress happens. We hear over and over again that we need to reduce our stress levels – and in some cases, yes! please stop rushing around everywhere at 100 mph. But stress is also a part of life and a very beautiful biological response to our environment. What we need is a more fruitful response to our stress – one that works for us instead of against us. There are 3 different stress responses – the classic (1) fight-or-flight response to stress; the (2) challenge response; and the (3) tend-and-befriend response. These involve slight differences in chemistry and extreme changes in your behavioral response to stressful situations. Self-awareness lets you pick which one you will go with because as you observe yourself begin to experience stress (or you anticipate it) you can override the automatic reaction (1) and go with (2) or (3) depending on what’s appropriate. We’ll dive deeper into these alternative routes but that is beyond the scope of this post for the time being. I highly recommend Kelly McGonigal’s TED talk (watch it here). The point is, when you have a developed sense of your feelings, thoughts, and desires you can choose how you react to the environment as it shifts around you. With greater control of your internal environment, you spend less time getting shifted around by the changing winds. You become steadfast in your direction personally and professionally. Each of these benefits come through the effort of getting to know yourself. Now you’re starting to get a picture of how self-awareness places itself within the vital 20% of the work of your life. Each of these benefits expands your capacity to do work and if your capacity is greater, your likelihood of success is greater. I will spend time exploring each of these benefits more in-depth over the next several months. How can you begin to move toward these benefits? Check out the sign posts I describe in this post. They are super easy entry points to greater self-awareness. What a great read and wonderful information! Thank you for sharing. This is excellent. I love that every time I read something of yours, I know my mind will be chewing on it for days, finding its way into my conversations and changing my patterns. Thanks for the work you do.